Did you get any new fun kitchen toys from Santa? I scored the new Ina Garten cookbook at my bookclub gift exchange (lemon chicken is first on the list–YUM!) and a new mandoline from my brother and sister-in-law, which will get a ton of use. Yay! How did you all do? Anyone make anything good? I’d love to hear! We’re hosting Christmas dinner this year for both sides of our family. And that’s wonderful. I love having a house full of people on a holiday and I have a lot of fun preparing for the main meal. But it does take a little thought and preparation to do it without being a slave to the stove while everyone else parties away in the next room–you want to be part of the festivities too, right? Every year, I serve lasagna as the main course. Part is that it’s become our family tradition. But it’s mostly because I can prepare the lasagna on Christmas Eve, layering noodles and sauce and cheese, and pop it into the fridge until the next afternoon. An hour before we want to eat, the casserole dishes go into the oven, and I go back to the living room to enjoy everyone’s company while they cook. On the side, we have a caramelized onion, green bean, and cherry tomato tian. It is out of this world good–a little sweet, a little savory, with just enough crunch to make things interesting. This, I put together Christmas morning after gifts are opened and breakfast is done, and then it goes into the oven for awhile with the lasagnas. I ask other people to take care of the rest of the meal–one person is bringing garlic bread, one is in charge of salad, and someone else brings soda and wine. For dessert, I do a very easy and light chocolate cake that starts with a mix (but you’d never know) and doesn’t need any icing. It’s a family favorite and people ask for it throughout the year. Christmas breakfast is equally simple. On Christmas Eve, I make cinnamon rolls that are divine–I’ll share that recipe with you soon, I promise. Christmas morning, I warm them and ice them quickly, scramble a few eggs in a large pan, and pour the coffee and juice. Christmas Eve? Chinese take-out. Honestly. Take a break when you can get it. Having dishes you can prepare ahead of time can really make a huge difference between having a great day yourself and feeling like everyone else’s indentured servant, no matter how much you enjoy playing with food. I wish you a wonderful holiday. Thank you for being here for the first six (ish) months of my blog. I hope you’ve enjoyed it. And I hope you enjoy every moment of this weekend. Cheers, my friends. I get a lot of questions about cookbooks–which I like, which I use, which I’d recommend for beginning or advanced home cooks. So in the spirit of my Mom Cook’s Christmas List, I give you my list of cookbooks I have that I recommend for different things, and the cookbooks I’m wishing for these days. If I had to pick just one cookbook that everyone should have, it would be Mark Bittman’s How to Cook Everything. It is the one I turn to when a food idea pops into my head and I need some direction, and the one I open when I need a specific recipe for something. I know most people recommend Joy of Cooking or the Better Homes & Gardens New Cook Book as their first go-to. I have both, and they’re good cookbooks. But Bittman does what he says–he teaches you how to cook anything. I picked up my copy at a yard sale for $1, but full price is a bargain. It’s a fantastic book. For those who like to entertain, even if it’s just for themselves and their families at home, you cannot go wrong with Ina Garten’s books — the Barefoot Contessa series. I have all of them (her newest was my gift at last night’s bookclub holiday exchange and I nearly jumped right out of my seat for joy!) and they are both beautiful and useful books. Her recipes are no-fail. Follow them and you’ll have delicious food, without fail. Almost no weird or hard-to-find ingredients and lots of great tips. Another kitchen Bible you should seriously consider is Essentials of Classic Italian Cooking, by Marcella Hazan. I love this for two reasons: first, the recipes are authentic. You won’t find anything from the Olive Garden’s menu here–it’s real food as you’d eat it in the old country, and it is spectacular. And second, there is a ton of fantastic information here for beginning cooks. Lots of techniques. Lots of facts. Lots of hints and tips, And the narrative is really fun to read. If you walk into my living room and glance at the coffee table, you’ll find one of my most prized possessions: a signed copy of Happy in the Kitchen, by Michel Richard. The recipes are absolutely divine. No other word. Some are really easy (try the chocolate covered grapes for your next party–people will *flip* over them) and some are very difficult and require special equipment that most of us don’t have. But again, fantastic technique, wonderful writing and commentary, and stunningly beautiful photography. Michel Richard thinks food should be fun above all else, and this book puts me in the spirit every time I pick it up. I’ve read it over and over, like a favorite novel. It is fabulous–a true showpiece. This is a fantastic gift for the amateur cook in your life, and he or she is sure to treasure it. My final go-to is the Cooking Light Holiday Cookbook, which I use all year for all sorts of things. Yes, these are light recipes. But they are delicious. Every one is a hit, and the directions are simple. This is another one with great photographs and it matches main dishes with sides and beverages seasonally. A great gift and something that should be in your kitchen. If you have a harried mom or dad in your life (or you are one! ), I’m having a great time with Aviva Goldfarb’s SOS! The Six O’ Clock Scramble To The Rescue, which came out earlier this year. Quick meals that are healthy and wholesome and filling, and that my entire family will eat. She includes all sorts of tips about planning and shopping, and the book is easy to follow. A great one for the family’s library. Some of the best recipes in the whole world come from churches and schools and community groups, who collect family treasures and compile them into spiral-bound references as fundraisers. One of the very best of these is the Junior League of Annapolis’ Tide & Thyme. These are real recipes from real families, and while many of them are regionally appropriate to the mid-Atlantic, where I live, they can all be adapted or made as they are anywhere in the country. Great ideas and wonderful recipes in here–I turn to it regularly. Sweet Magic: Easy Recipes for Delectable Desserts, by Michel Richard. More amazing recipes from my favorite chef, with paintings he’s done of the dishes. I cannot wait to get my hands on this. Gourmet Today, by Ruth Reichl. I miss Gourmet magazine with every ounce of my being–its monthly thunk through my mail slot meant an evening or two of pure joy and weeks of fun in the kitchen. This cookbook brings together recipes from that magazine that are designed to work with our busy lifestyles. How can it be anything but wonderful? Baking: From My Home to Yours, by Dorie Greenspan. I so enjoy her recipes online. A cookbook of them is absolutely on my list for the future. Dessert University, by Roland Mesnier. Mesnier was the White House pastry chef for decades, and his memoir, All The President’s Pastries, is among my favorites. His reputation is amazing, and I plan to learn from this one soon. So there you have it. And now I want to know: What are your favorite cookbooks, and which are you wishing for? Leave a comment! The recipe I posted the other day? I messed with it. And I think this one is better. I melted the butter to better incorporated it through the dough–you can only do this with doughs you’re going to chill for awhile afterwards or it’ll spread too much, and this one lives in the fridge at least overnight. I also used bread flour instead of AP to make these chewier, upped the vanilla to play off the caramel a bit more, used dark process cocoa instead of regular (I found Hershey Special Dark cocoa in my Soviet supermarket so you shouldn’t have any problem), added espresso powder to give the cocoa a little pop, and salted the dough before wrapping up the cookies, echoing the hot trend in caramel candies this year. My kids and husband loved these. The first batch was gone in a day and a half. I really liked them too. Melt the butter. Beat sugars and butter until fluffy, add eggs and vanilla and beat well. Stir together bread flour, baking soda, espresso powder, and cocoa. Add flour mixture to butter mixture and blend well. Cover and cool dough in fridge overnight. Scoop cold dough out by heaping teaspoons. Flatten into discs. Sprinkle a pinch of salt over each disc, place a Rolo on top, and roll the dough around the candy, covering it completely. Bake 8 minutes at 350 degrees. Do not overbake; they will look quite soft. Cool in pan slightly then move to a piece of waxed paper. Cool completely. You all saw my Mom Cook’s Christmas List the other week, yes? Today, I give you the opposite of that. Today, my friends, we’re going to talk about things you probably own that you should chuck. I know, I know. It all cost money at one point. And you may well be very happy with these gizmos and gadgets and toys. I sure was, before I started getting serious about my kitchen and my own cooking. I ask only that you read and think a bit, and really consider getting rid of this stuff, either because it’s dangerous or because it’s doing a disservice to your food. And if you’re going to spend all this time preparing food, shouldn’t it be as good as possible when it gets to your table? Dull knives. Stop buying $10 knives. They can’t be sharpened effectively, and you’re both going to butcher your beautiful vegetables and cut yourself using them. Get yourself one or two really good knives–Target has a line of Henckels knives that is both affordable and excellent quality, and I find my beloved Wusthofs on sale all the time. If you can’t cut a tomato without smashing the poor thing, the knife has lived its useful life. Glass cutting boards. They’re pretty. I know. But they are hell on your knives. Ditto for marble–stop cutting on that. You need a wooden board for fruits, vegetables, breads, and cheeses, and a hard plastic board for meats (I have another hard plastic board I use for garlic and onions because they tend to hang around a wood board, too). Use the marble board for pastry dough, use the glass boards as trivets, and cut on wood or plastic–and then sanitize them properly after each use. Nonstick pots and pans. I’ve told you before that there’s a lot of research out there that says these things may not be so great for your family’s health. You can look that up yourself. If you have any nonstick cookware that’s chipping or peeling, it needs to go in the trash, like, yesterday. You do not want to eat that stuff, and you certainly don’t want your children eating it. Replace it, preferably with anodized aluminum, stainless steel, or cast iron. Garlic presses. Want to make your garlic bitter or tasteless? Run it through a garlic press. You know that juice that’s all over the press when you’ve mangled a clove through there? That’s the flavor part, and it’s not in your food! It takes two seconds to peel and chop fresh garlic, and it keeps just about forever in a dark, cool place (mine lives in a little open container in a cabinet, along with potatoes and onions). You’ll get so much more flavor doing it the knife way. Promise. While we’re at it, please chuck jarred chopped garlic. It just tastes odd. Either use fresh or get some frozen chopped garlic at your grocery store–I buy Dorot garlic cubes at my pathetic Soviet grocery store, so you can too. They’re with the frozen veggies, in a little box with a red lid. Next-best thing to fresh. And nothing at all like jarred (ick). Sponges. Not all of them. But run your sponge through the dishwasher every time you run a load thru (put it inside your silverware bin so it doesn’t go flying around in there) and chuck them once a week. They are bacteria farms. Keeping them fresh will keep your family healthier. I had big plans for today. I had four articles to work on, two Christmas gifts to buy at the sporting goods store, a mistake Christmas gift to exchange at Target, stamps to purchase, client Christmas cards to address, two scout meetings to attend with two children, three necklaces to make and ship from my Etsy store, and a house to scrub down after the weekend. So I went to bed early last night, with visions of credit cards and car keys dancing in my head. Thank goodness for small favors, because I was jolted into consciousness at 2:30 this morning by the unmistakeable sound of a child throwing up in the next room. It wouldn’t be the holidays if somebody didn’t get sick, right? To make a long story short, there’s been one little nap between then and now, along with a lot of laundry, a lot of Mommy-comforting, a little work, a little more juggling to get child #2 to and from while child #1 stayed within 10 feet of the potty at all times, and coffee. God bless and keep coffee. It’s 8:20 p.m. as I write this. The sick child has been–blessedly–asleep for an hour. He’ll stay home with me tomorrow. The well child was brought home from her scout meeting by a very sweet neighbor (thank you, thank you), helped with homework and a shower, given dinner, and cajoled into silence with a normally-forbidden TV show so her brother could sleep. Every surface of the house has been washed in hot water or Cloroxed into submission. The husband is out to the movies with friends, the Labrigator is passed out in a corner (having spent the whole day whimpering and pacing over her Boy), and I am snuggled into my favorite chair with my laptop, next to my lit Christmas tree, hoping against hope that things will stay quiet until daylight. All of this is a very long-winded way of saying it was a comfort food kind of night. I needed something soft and warm. 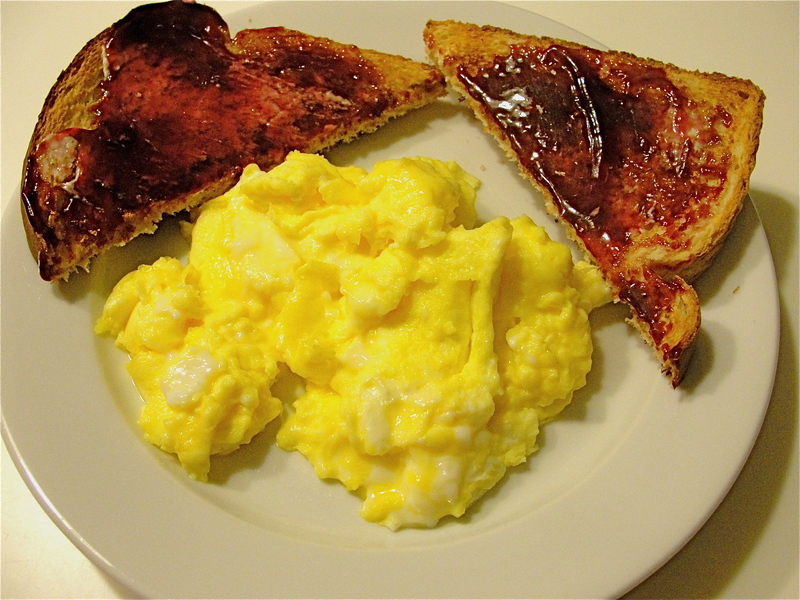 Slow-cooked scrambled eggs were perfect (along with a slice of white toast with grape jam; sometimes a girl needs Wonderbread, yes?). Slow-cooked scrambled eggs are just that–eggs cooked over a very low flame, just until they’re firm. They take a few extra minutes, but once you’ve had them, you’ll never want them any other way. I highly recommend free-range organic eggs. I am not a health food girl, but free-range eggs taste nothing (nothing!) like conventional eggs. They are amazing. And they only cost a few cents more. I also recommend eating whole eggs. Look, an egg is a whopping 75 calories. Do yourself a favor. Satisfy all of your senses and eat the dang yolk every so often. You’ll ultimately be more satisfied and your taste buds will be ecstatic. Heat a small pan over low heat for about five minutes, while you whisk together the eggs and milk in a bowl. Don’t beat them up! Gently whisk, so you blend together the whites, yolks, and milk, and incorporate some air in there. Spray your pan with nonstick spray or olive oil, and melt the tiny pat of butter. Pour in the eggs. Using a silicone spatula (wooden spoons are nasty, ladies and gentlemen), gently stir, stir, stir. You’re blending together the egg mixture with the butter, and you’re incorporating a bit more air. Stir them every minute or so until they’re cooked. Not cooked to within an inch of their lives, but still a bit on the runny side–they’ll finish up on the plate. Slide them onto your plate, give them a minute to wrap things up, and enjoy. I’m in this cookie competition this week. Everybody bakes and brings a cookie, we talk about why we’ve chosen that particular recipe, and then a judge picks his favorite. It’s mostly for fun and we always have a blast–great company, a flawless hostess who makes everyone smile, and a bag full o’ cookies and fun loot to take home. I’ve been testing cookies this week. I’m pretty sure we have a winner based on my kids’ reaction to one last night. This one wasn’t that. I’ve been intrigued by this recipe for a few months, to be honest. Vanilla wafers are so good out of the box, that homemade, I imagined, must be divine. So I hauled out my food scale and stocked up on good vanilla, and followed the directions to a T. The result? I almost never say this, but I’m going to stick with the kind in the yellow box. These were good, don’t get me wrong, albeit salty (I’d substitute regular salt for kosher next time). 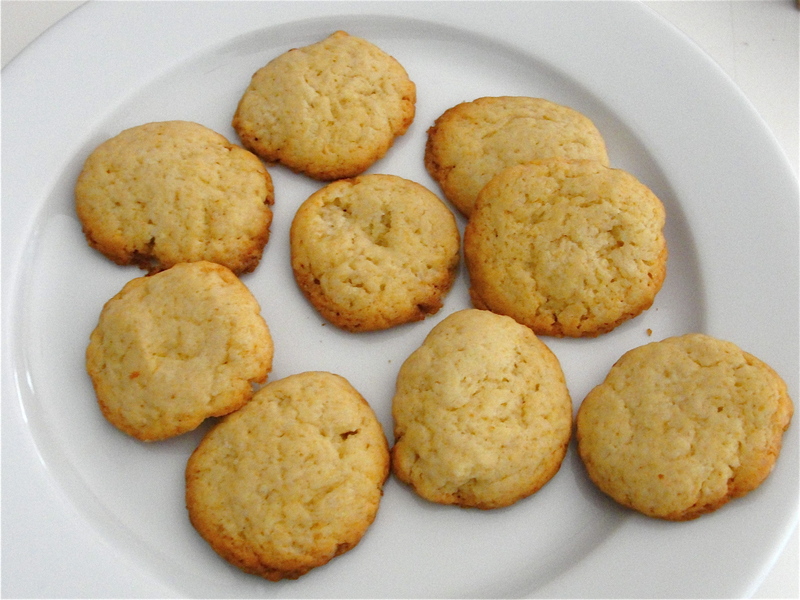 But they lacked the satisfying crunch of the commercial cookies, and were more like slightly vanilla-ey butter cookies. And butter cookies don’t need that much effort, you know? I will say that I made vanilla sugar for the first time during this process (whisk together 2 cups of sugar with a teaspoon of vanilla extract, spread it on a cookie sheet to dry for 5 hours, store in a tightly-lidded container) and that is divine. Well worth the time and I’ll use it all up, no doubt. So that’s a plus. If you’re trying to avoid the chemicals and such in commercial cookies, it’s worth giving this recipe a shot. But if you’re competing for year-long honors anytime soon (*grin*), these aren’t your entry. Sift together the flour, baking powder, and salt in a small bowl and set aside. Cream the butter and vanilla sugar in the bowl of a standmixer on medium speed for 2 minutes, stopping to scrape down the sides of the bowl after 1 minute. Add the egg and incorporate on medium speed for 30 seconds. Scrape down the sides of the mixer bowl. Add the vanilla extract and milk and blend on low speed for 15 seconds. Add the flour mixture and mix on low speed just to incorporate. Chill the batter in the refrigerator for at least 10 minutes before scooping.